London, Thursday 24 April, 2014 – Hard Rock International are excited to announce details of their debut ‘Hard Rock Rising On The Road’ Truck Tour, which will travel the UK and Europe this summer, kicking off in Glasgow on Saturday 17 May before heading to, Edinburgh, Manchester and London, plus various European cities, before ending at the inaugral Hard Rock Live Rome music festival on Saturday 12 July. The’ Hard Rock Rising On The Road’ Truck Tour will bring a unique concert experience in the form of a custom, 31-foot truck that converts to the ultimate live music stage to a total of 15 locations in Europe, At each stop, ‘Hard Rock Rising On The Road’ offers fans an exciting free concert experience hosted on the built-in stage, with local bands and emerging artists, plus a pop-up bar, a Rock Shop retail store and fantastic giveaways. The tour will launch on Saturday 17 May from 4pm-8pm at Glasgow’s Soar at Intu Braehead, where Scottish music fans will be able to see bands including: River 68’s, We Were Kings, and the London and International winners of Hard Rock Rising 2013, The Carnabys. The tour will continue through the weekend, with Hard Rock Cafe Edinburgh will welcoming the truck on Sunday 18 May on George St between 2pm- 8pm, with performances from Titus Pullo, Shooting Stansfield, We Were Kings, and The Carnabys. On Saturday 24 May between 6pm- 10pm the truck will be pulling into Manchester’s Cathedral Gardens for performances by The Answer, Fear the Fallen, and The Carnabys. Making the last UK stop on Saturday 31 May, London will see the truck arrive at ‘The London Piazza’ at The O2 Arena between 2pm- 8pm, with members of the public in this city hostpot treated to an exclusive performance from X Factor 2013 contestants, Kingsland Road, as well as Hard Rock Rising London winners 2014, Blind Pilgrim. ‘Hard Rock Rising On The Road’ will make its last stop on Saturday 12 July at the Piazza del Popolo in Rome where it will serve as the second stage for the first Hard Rock Live Rome music festival. 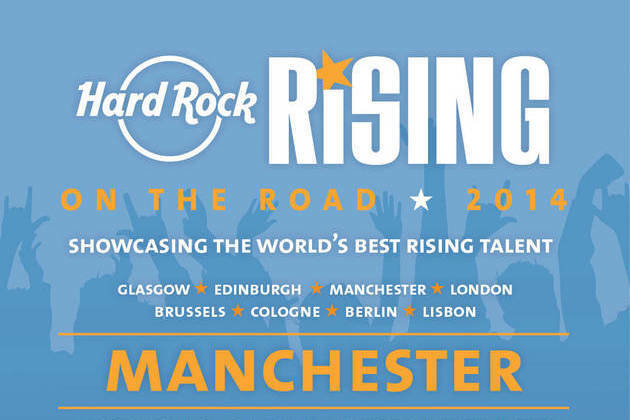 Complementing the star-packed main stage, the Hard Rock Rising stage will showcase Hard Rock’s connection to the new music scene and commitment to developing bands by bringing fans the hottest new artists and talent.